Indian Railways offers normal online train ticket booking for general public using Internet through IRCTC Login from 00:30 a.m. to 11:30 p.m. on all days of week, including Sundays. One can book railway tickets 120 days in advance, excluding the date of journey. If you want to book ticket for 120th day which is also known as opening day booking then you can do so only after 8 a.m.. If you try booking for opening day's tickets before 8 a.m., the reservation will fail but your account will be debited. However, IRCTC will refund the entire fare and service charges, but you are likely to forfeit the bank/ card transaction charges. On a single ticket, maximum six berths/ seats can be booked at a time between any two stations. A registered user at IRCTC can book a maximum of ten tickets in a month. Tickets can be booked only against General (GN), Senior citizen (SS), Ladies (LD) and Tatkal (CK) quota. Only Senior citizen concession can be availed for the tickets booked through internet. 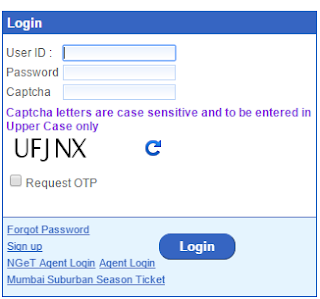 STEP-1: For online booking, enter your user ID and password on the login page of IRCTC, as shown below. Please note that captcha letters are case sensitive. You must be careful about small and capital letters, as well as difference between numbers and letters, such as 5 and s. We can also ask for OTP (one time password) if Captcha letters are not clear, but it may take more time. STEP-2: After you login to IRCTC, a portion of the web page that appears is shown. Two options will be shown, one is "Plan My Journey" and other is "Quick Book". If you do not know the train number, then select "Plan My Journey" option as shown above. Enter source and destination stations, date of journey and E-ticket option. You should not select I-ticket option as it is delivered through courier and will take time. If you want to book under handicap concession, then check the given box. If you know train number, then you can select "Quick Book" as shown below. You can also fill the form using "Select Favourite Journey List". If you want to know how to create "Master List", "Travel Lists" and "Favourite Journey Lists", then follow "FASTER BOOKING OF INDIAN RAIL TICKETS USING IRCTC LOGIN". 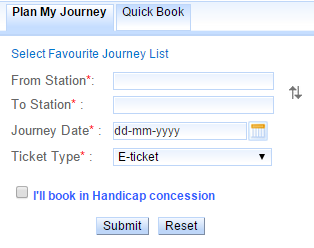 STEP-3: After filling "Plan My Journey" option, click "Submit". A portion of the screen which appears is shown below. The above screen shows the available trains and classes of travel. Select quota (General/ Physically Handicap/ Ladies) and click on class of travel against the selected train. If you select "Quick Book" option then following screen appears. Here, you have to have to enter Train No., Source/ Destination stations, Journey Date, Class, Quota and ticket type. Clicking "Submit" takes you to STEP-5. 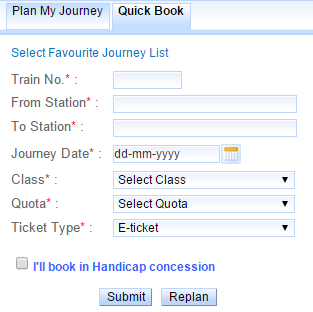 STEP-4: After clicking in the previous step in "Plan My Journey" option, the following screen appears. This screen shows the availability of seats for the next six days. You can book ticket for a particular day by clicking on "Book Now". STEP-5: The next screen which follows is shown below. Here, you can fill the details of individual passengers, mobile number to receive sms, names of children below 5 years of age, etc. It also shows the option "Select Your Travel List" and "Select Passenger From Your Master List". By clicking either of these two options, you can fill the form quickly. You can also save this as separate "Journey List". From this screen, you can also check the availability of seat and fare by clicking on "Show Availability and Fare". After entering the Captcha characters and selecting the payment option (Net Banking/ Payment Gateway/ Credit Card/ Debit Card/ Cash Cards/ Wallet/ IRCTC Prepaid/ EMI) and the particular bank through which the payment is to be made, click on "Make Payment". It takes you to the final screen where you can make payment using the option selected earlier. Finally, you can take the printout of the booked ticket. Indian Railways Tatkal tickets can be booked for all classes except First AC (1A) and Executive class and Tatkal e-ticket for only four passengers per PNR can be booked. Tatkal i-ticket cannot be booked. Please note that no concession is allowed in Tatkal booking and it may not be available for some trains/ locations. Tatkal E-tickets can be booked one day in advance excluding the date of journey from the train originating station.It can be booked on the opening day from 10:00 hrs for AC classes (1A/ 2A/ 3A/ CC/ EC/ 3E) and at 11:00 hrs for Non-AC classes (SL/ FC/ 2S). If a train departs from a station on 2nd of a month then Tatkal booking for AC class will begin on 1st of the month at 10:00 a.m. and for non-AC class at 11:00 a.m. If the train continues its journey on 3rd of the month or beyond then Tatkal booking for such places will also start on 1st and not on 2nd of the month. Tatkal ticket booking is not very much different from normal ticket booking. The only difference is that you have to select "Tatkal" for "Select Quota" option. Also, "Quick Book" option cannot be used but "Select Favourite Journey List", "Select Your Travel List" and "Select Passenger From Your Master List" options can still be used. Other difference is that at least one passenger has to enter his ID number while making Tatkal booking. The passenger must carry this ID card during journey as well. The different photo ID categories are given below. Rest of the process is same as normal ticket booking. 1. Passport. 2. Voter photo identity card issued by Election Commission of India. 4. Pan Card issued by Income Tax Department. 5. Photo Identity card having serial number issued by Central / State Government. 6. Student Identity Card with photograph issued by recognized School/ College. 7. Nationalized Bank Passbook with photographs. 8. Credit Cards issued by Banks with laminated photograph. 9. Unique Identification Card "Aadhaar”. 10. Photo identity cards having serial number issued by public sector Undertakings of State/ Central Government, District Administrations, Municipal bodies and Panchayat Administrations. There are Tatkal charges per passenger in addition to normal ticket, as given in the following table.